Differences between a stock 1988/89 Supra and a TurboA Supra. Thanks to Nick.T @ turbosupras.com, Sliding Elephant, Adam, Jazz and everyone else that helped compile this. If you copy it or use it please give a link back to here; don’t claim you came up with it. – Interior was Leather as standard. – Suspension Package upgraded (much stiffer than standard). 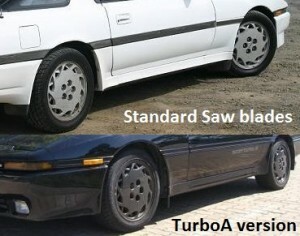 – Black coloured alloy wheels “Saw blades” with 225 all round. – Available only in Black : colour code 202. – The identification code should read “BLMXZ” if it is real turboA. – Max speed reached 249 – 251km/h at stock.